Baby showers have been growing in popularity in recent years. First time around I had a lovely lunch with my two besties (& one offspring bestie). Since then I've been to a couple of friends showers and it's always been lovely. There is something special about sitting with your friends and either lamenting the pregnancy woes and using cake as a means to numb the worries of the lack of sleep. Or laughing at the male 'foot firmly in mouth' faux pas along the pregnancy journey. It's nice to be with women who have one baby or more who can sympathise or at least remind you of life after pregnancy. Well my girls really came good and arranged this wonderful surprise last weekend. I was greeted by friends, decorations, food and tea until it was coming out of our ears. Bliss. 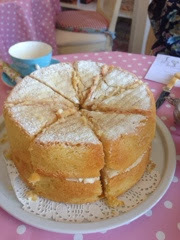 Just look at that victoria sponge cake, it was as delightful as it looks and we all had to take some home because there was so much. 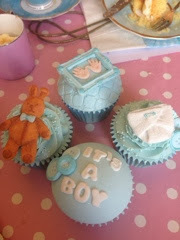 The cakes were amazing and I really got in the spirit of realising this is happening and soon I'll be a mother of two! One pink and soon to be one blue. (Let's hope that sonographer got it right!!! There's a lot of blue in my world at the moment). We chatted about how things would change and I got some wonderful presents - including a memory stick of advice from my friends on how to manage with two children. 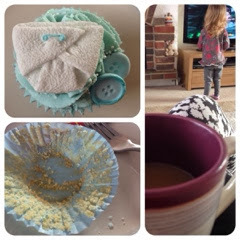 I managed to defeat my smaller than small stomach capacity and wedged enough cake and tea in to make most people proud. It was worth all the heartburn in the world. When I got home the toddler greeted me with 'yey it's cake' rather than my preferred 'yey it's mummy!' Oh well I've created another cake addict like myself. 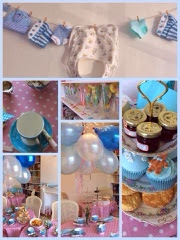 If you are looking for a venue in the south east then check out Sweet Sundae in Chislehurst, Kent, as it was really a perfect venue, decorations and cakes! I had so much fun that I had to go to bed at 9.30pm...super rock n roll behaviour! This is how I spent the following day, nursing a rubbish cold and feeling worn out!